Located on 5th Street in Sarasota’s new Design District, RISDON on 5th is a mixed-use housing project consisting of twenty-two residential units over six retail spaces. The units interlock creating a variety of unit types. Combining six one story 2 bedroom condos; six two story 3 bedroom units; four penthouses of varying sizes; and six 750sf one bedroom condominiums, the project offers a wide menu of options. All units benefit from loft ceilings of 12 to 20 feet over living spaces. Eighty percent of the 28 condominiums are now under reservations. The above rendering illustrates the 200 foot long elevation on 5th Street. Halflants + Pichette: Studio for Modern Architecture was featured on the cover of the Florida / Caribbean ARCHITECT Winter '16 issue for their work on the Verandah House in Sarasota, Florida. The award winning project was further spotlighted in a two page spread. The quarterly magazine, serving as the official publication of the Florida / Caribbean region of the American Institute of Architects, is distributed to every architectural office in Florida and Puerto Rico. The Verandah House located in Sarasota’s McClellan Park was recently awarded a National Gold Award by the Association of Licensed Architects. Featuring generous overhangs, shaded terraces and solar panels mounted on glass, the home embraces Sarasota’s subtropical latitude as it opens to its courtyard. The space under the overhanging roof serves as a verandah mediating the climate. The cantilever is created by custom light steel trusses from which a balcony is suspended. A continuous clerestory runs between the trusses. The award will be presented at a design reception in Chicago on November 6th. The Vanguard Lofts housing project broke ground in the Sarasota Design District. The event was flawlessly organized by Frank Lambert of Premier Sotheby's International. All of the large three story units have been presold. Pictured from left to right and handling a gold shovel with dexterity: Frank Lambert, Rob Stettler, Rigo Rivera, Dora Beatty, Peter Macdonald, Michael Halflants, John Pichette, Kevin Bryon, Dean Crowley, Jason Wilson, Kelly Gilliland, Tom Zernick, Norm Gollup, Karen McKeivier and Michelle Burke. Since starting construction late last year our Philippi Creek has steadily progressed as all the CMU Block work has been completed along with a majority of the roof framing. Over the next few months the project will begin to take shape with installing the windows, stucco finish and interior rough-ins from the Electrician, Mechanical and Plumbing subcontractors. Five of the firm’s residential designs are currently under construction on coastal or riverfront sites from Venice to St Petersburg. Most of the projects are being built as design-build ventures, but we are also enjoying working with skilled contractors to bring the others to completion. All five houses will be completed by the end of this year. 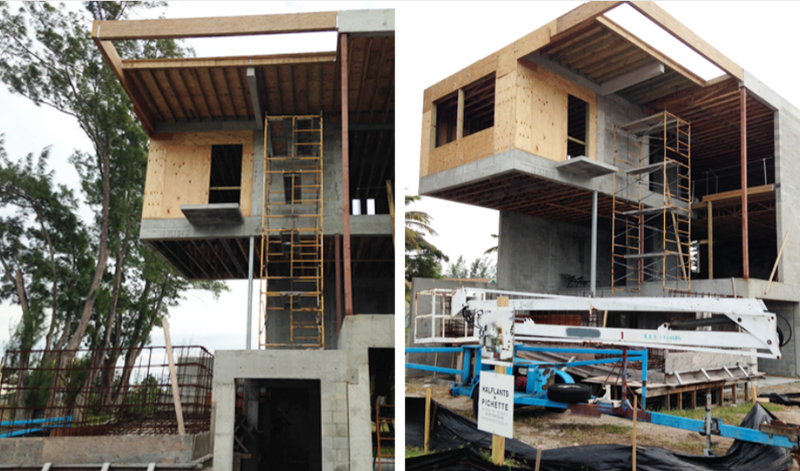 The Ann Maria Residence has steadily progressed in construction. CMU block walls have been built to the rooftop along with the concrete tie beams, allowing the master bedroom to cantilever over the pool (shown in the picture above). The roof deck is installed. We will start framing the interior this week and into the holiday break, allowing electrical and plumbing rough-ins to begin the following week. Halflants + Pichette has won 3 National ALA Design Awards (Association of Licensed Architects) for the Venice Residence, the Anna Maria Residence and the Vanguard Lofts project. Firm Principal, John Pichette, will travel to Chicago next month to accept this recognition at the National ALA award ceremony.